Milton Hopkins was awarded the Albert King Award in Memphis for the best guitarist from the Jus’Blues Music Foundation. His career spans decades from his beginning with Little Richard who formed a band, Tempo Toppers, in 1950. Hopkins was not comfortable with the wilder side of the industry and bowed out in ’52. He went on the road with the late, great Johnny Ace and Willie Mae “Big Mama” Thornton until the death of Ace in 1954. After his stint in the Army, Hopkins met up with his musical mentor, Gatemouth Brown. He also joined up with The Upsetters who were one of the top R&B/Rock & Roll bands in the US at the time and were the number one choice for persormers such as Sam Cook, Jackie Wilson and The Drifters. He was also asked to join a studio band with Motown Records but Hopkins declined. 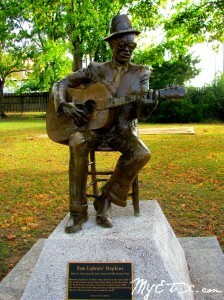 Hopkins’ famous cousin, Sam “Lightnin” Hopkins, was one of the most famous blues players in the world but traditionally played solo. Only once did Hopkins get to play with him during his career. Milton Hopkins has been featured in Living Blues magazine and has received a Houston Blues Society Lifetime Achievement Award. Check out the Houston County Museum at the Railroad Depot right next to the new Amphitheater. It is a treasure trove of memorabilia of Houston County. There are highlights from the founding families of Crockett, a display on the Sallas family and a plethora of displays and artifacts from contributors from Houston County. Don’t miss this opportunity to see a bit of history from this historic area. This series is produced by Piney Woods Fine Arts Association and is funded in part by a gift from the Jake & Jill Capriellian Estate. Mark your calendars: Mural dedication is at 7 p.m. and then walk over to the Railroad Depot Museum from 6-8 p.m. which will be open that evening. Concert begins at 8 p.m. sharp! Come join us for the FREE summer concert series held at the new J.B. & Kathryn Sallas Amphitheater in Arnold Park next to the Houston County Museum at the Railroad Depot on 303 South 1st Street in Crockett. Come rain or shine; bring your blanket or lawn chair and cooler if you like. There will be CONCESSIONS available for purchase. For more information call the Piney Woods Fine Arts office Monday-Friday from 9:00-1:00 at (936) 544-4276 or go to www.pwfaa.org and to keep up with updates follow us Facebook! 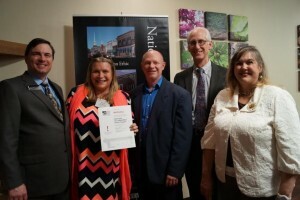 New Braunfels, Texas— The Texas Historical Commission (THC) commended Marshall Main Street for successful annual progress as a designated Main Street community, one of 58 to be recognized this year.